I’ve been fortunate to gift many quilts for many special occasions – birthdays, weddings, babies, just because. There’s nothing quite like the feeling of seeing someone run their hands along the stitches and watching their eyes light up while they investigate all the details of the quilt. I wanted to share a couple of my most memorable quilt-giving experiences. 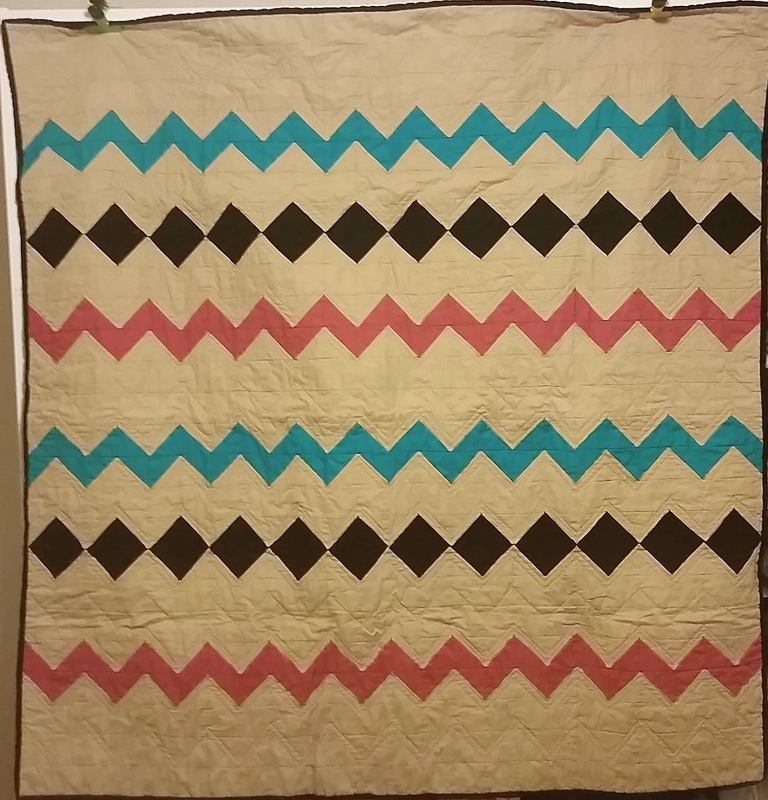 One of the first quilts I made was for one of my nephews. My nephew is a big fan of that building blocks brand everyone knows (*wink*). 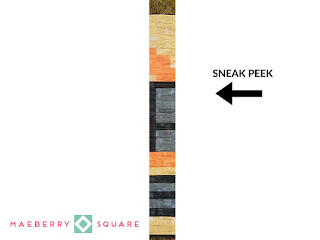 I thought it would be pretty easy to design a quilt that looks like blocks. Designing and piecing the quilt was easy. The custom long-arm work was not. It took me several trips to get it done, but I was so pleased with the final result. My nephew was amazed and excited when I gave him this quilt! When a good friend got married, I knew I needed to make a quilt to commemorate this special time. She and her husband are big fans of a well-known Iowa university. I spent a lot of time figuring out how to pixelate the school logo. I was so excited with the final result! Apparently so was my friend who sent me the nicest thank you note I’ve probably ever received in my life. I believe the quilt will be cherished for many years to come. When another friend got engaged, I wanted to create a snapshot of this time for her and her new family. 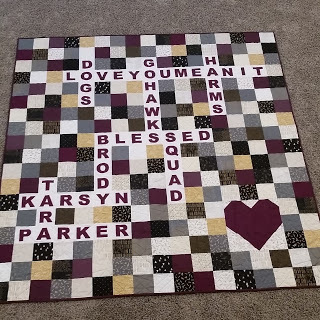 I took several key phrases she used to describe her relationship, as well as her and her new husband’s names and his children’s names, to create a crossword puzzle quilt (I’ve blogged about this quilt before). My friend was so appreciative of the quilt – she wrote a touching blog post about it (have a read and enjoy the rest of her really honest, funny posts!). 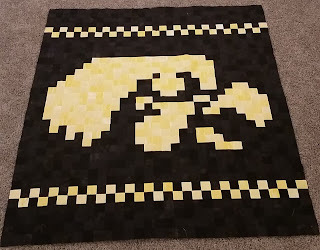 I know this quilt will be loved. 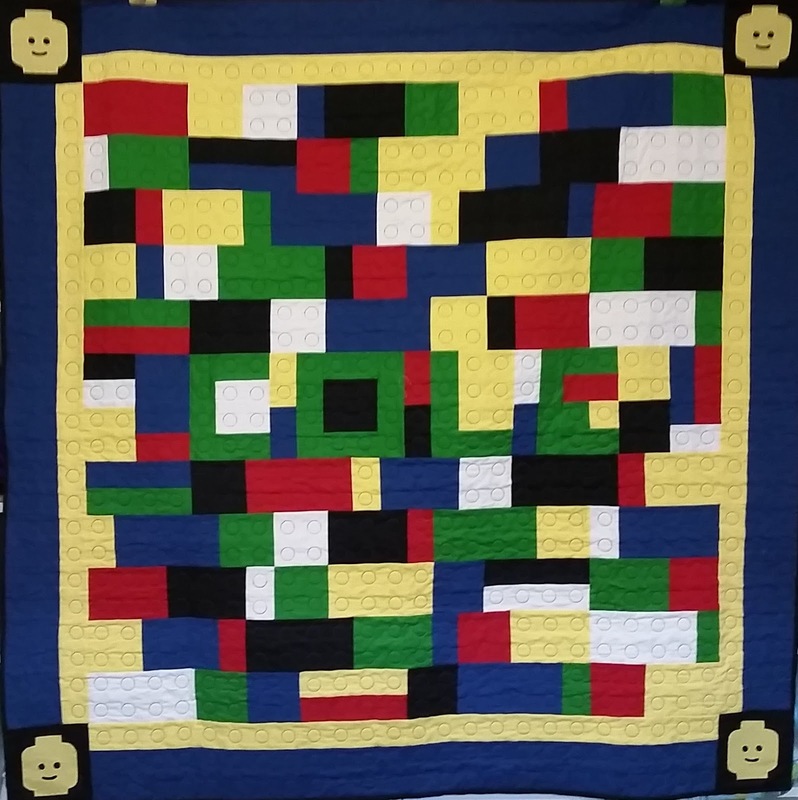 Unlike the other quilts mentioned, this quilt was not gifted for a happy occasion, but it was gifted with an enormous amount of love. My grandmother was misdiagnosed with an illness for several years. After loads and loads of research, guessing and tests, she was diagnosed with ALS. It advanced quickly from that diagnosis and her health deteriorated rapidly. I speedily put my hands to work making a quilt for her. When I was a kid and visiting her, we would go on walks. We always looked for coins on the ground and just about every time came home with a penny here or a dime there. I loved that time together. My grandmother lived in the Southwest, so I designed a quilt that reminded me of a Southwest sunset. 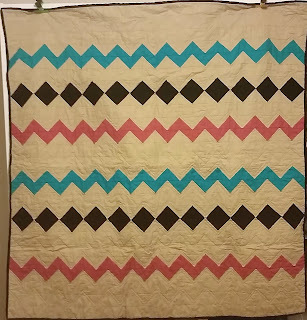 I know that to many people, this quilt looks like nothing special. To me, it encapsulated the memories engrained in my head. I had to mail this quilt to my grandmother. She expressed the greatest appreciation through very few words (she was at the point of losing her speech) over the phone. I felt every ounce of thankfulness she had for that quilt. She passed not long after that. What’s your favorite quilt-giving experience?